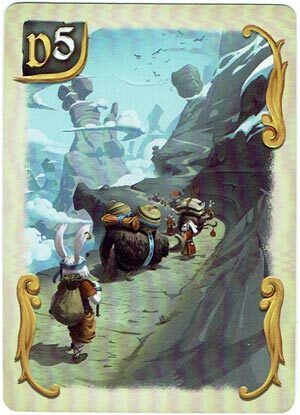 Home Featured Articles Bunny Kingdom Review – One of my Favorite Board Games! 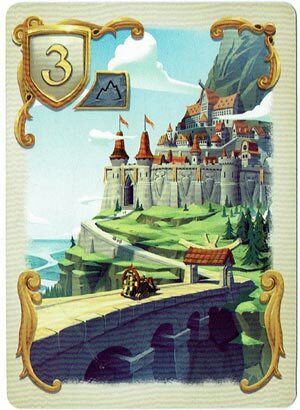 Bunny Kingdom Review – One of my Favorite Board Games! 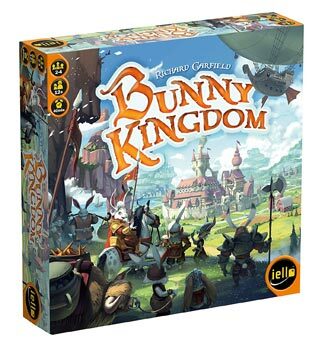 Bunny Kingdom is a new board game from iello games, designed by Richard Garfield. Richard Garfield is the mastermind who created the Trading Card Game Genre with his Magic: The Gathering card game. He also created over 20 other popular games including: King of Tokyo, RoboRally, Netrunner TCG, Star Wars, TCG, Hive Mind, and many more games. First let’s look at the gameboard. The board is a 10×10 grid with obviously 100 individual territory squares for each player to build a kingdom. Some squares can produce resources like wood, carrots or fish. Other squares are blank fields or mountains that can let you build cities, or farm/mine other resources. There’s also a scoring track to track game points. There are a total of 144 rabbit figurines. That’s 36 bunnies for each color. You place your bunnies on territories and expand your personal kingdom. Each continuous territory you control is called a “fief”. Cities are buildings and they come in 3 different strengths. The tower’s spires represent each figure’s strength. There are a total of 24 building tokens in the game. Now let’s look at the cards. 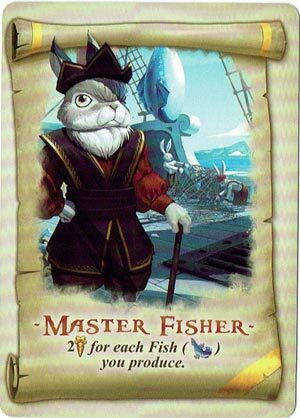 There are a total of 182 exploration cards: Territory Grid Cards; Building Cards; Parchment Cards; Farms; Camps; and more! Let’s take a look at a few examples. Obviously 100 of these cards are the grid cards – there is one card for every territory on the grid. If you draft a grid card, you get to place a bunny on that area. You now own that area for the rest of the game. If that territory produces a resource, you also now produce that resource. City Cards allow you to build cities on territories you already control. Three strength cities can only be built in mountain locations. Parchment Cards are kept secret until the end of the game. These cards reward you bonus points at the end of the game. 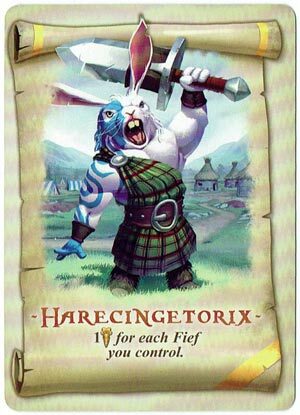 These cards can be sneaky powerful, and you may decide to build your bunny kingdom differently based on parchements you draft. 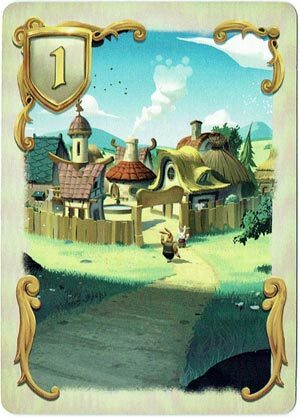 Even More Cards: There are also other cards that provide additional resources, treasures, camps and more. The game is played over 4 rounds. In a four-player game, each player is dealt a total of 10 cards. Each player examines their hand and selects two cards of their choosing and places them on the table in front of them. The remainder of the hand is temporarily set aside. If you chose a Parchment Card you do not flip over the card. You keep this secret in a separate Parchment Pile. 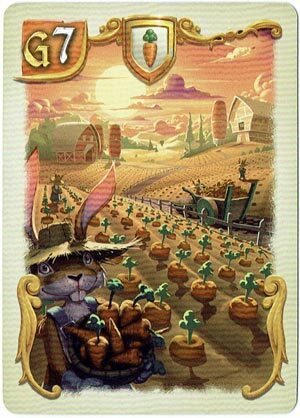 If you played Territory Card you immediately place one of your bunnies on the board in that grid space. The card is then placed in your own individual discard pile. If you played a city/building card. You keep that card face-up in front of you and take the corresponding city figurine from the supply and put it on top of the card. You can build this city later during the “Construction Phase”. If you played a Resource card. You keep that card face-up in front of you and take the corresponding Resource from the supply and put it on top of the card. You can build this Resource later during the “Construction Phase”. Once everyone has played their two cards. They will pass their remaining cards to the person on their left or right depending on the round. You again select two cards just like you did before. You Rinse and Repeat until all 10 cards have been drafted and played. Now you have the opportunity to build your cities, camps and resources. This is optional. Since there are four rounds, you can elect to wait for a later construction phase if you wish. Cities and Resources and Camps cannot be moved once you place them. You now Harvest your Golden Carrots from all your fiefs. Golden Carrots are calculated by multiplying Strength x Wealth for each fief and adding them together. Bunnies multiply and so do you! Strength = the total number for spires/towers from your cities. Wealth = total of number of different resources your fief produces. Once everyone has calculated their points from their Golden Carrots you play another round. Deal out 10 more cards to each player and repeat the Draft/Construction/Harvest Phases until you’ve played a total of 4 rounds. After all 4 rounds have been played, everyone Reveals their parchments and scores them. Our family usually lets the person in last place go first and score each of the parchments. After all parchments have been scored, the person with the most total Golden Carrots points wins the game. Components aplenty. There’s a lot here: 144 rabbit figures, 39 city figures, 24 building tokens, a fold-out board, 182 playing cards, and a well-designed rulebook. Most of the components seem well made for what they are. The cards are standard TCG size. Drafting! I love drafting in games. You feel like you have some sort of control over your master plan. Every card can seem good. So your decisions can be tough. Building your bunny empire. You decide if you want to build one giant kingdom/fief or a bunch of little fiefs. It’s fun watching everyone’s empire’s grow very quickly. Kingdoms multiply like rabbits! Parchments for the win?! – You decide if you want to try to win by taking parchments, or ignoring parchments altogether. Parchments can swing you to victory, or drag you to defeat. The artwork on the cards is fantastic. Fairly easy to teach. One practice game and you “get it”. No player elimination. Everyone plays until the end. You might think you are losing, and actually pull out a victory with Parchments. The box is well designed, and holds all the components nicely. Game time. This game plays quickly once everyone knows how to play and score. This game will take longer for newer players, but can be played in about 45 minutes once everyone is experienced. This is perfect for a game like this. The board can feel too small. The overall box is about 11-1/2″ x 11-1/2″. I feel cheated that the board is only about 14″x17″. The board could have easily been 20″x20″ or 22″x22″. Or even a 3 fold board like Ticket to Ride boards. 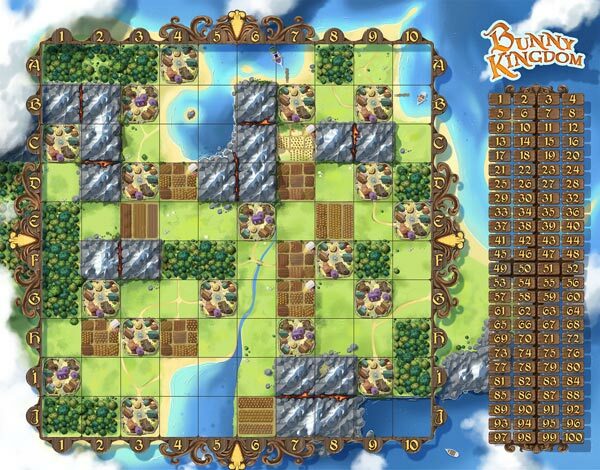 When each person places 20 bunnies or so, all their buildings, and all their resources, the board can look chaotic. I’m sure this might drive a few people bonkers. Standing to Score. Actually this can be a pro or a con, but let’s list this as a con. You have to stand up several times during the game to see the board properly. Especially when scoring. You cannot see all the resources near towers unless you stand up. But, your legs won’t cramp up from sitting too long though. You have to be careful with the plastic city towers. Don’t chuck them around, as it feels like the towers might break off the cities. One piece was broken when we bought our copy, and we had to glue it back together. Math! Scoring can be a crazy affair in the 3rd, 4th and Parchment Scoring Rounds. I personally don’t think it’s too horrible but I have an Engineering Degree and my wife has Master’s Degree in Math. But if you hate math, you might hate the scoring. 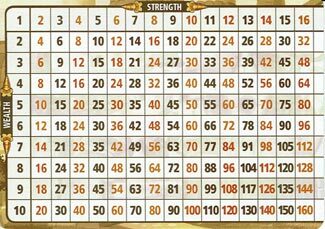 The designers must have realized this too, so they included standard multiplication times-table Player Aid cards for every player if they need one! You might consider letting your best mathlete do all the scoring. After all is said and done, I love this game. We have a big gaming family, and this game got played more than any other game over the Holiday season of 2017. It’s skillfully combines Trading Card Game Drafting and Area Control. The board does get busy at the end of the game, but that is part of the crazy fun. The game does not feel like it will get stale over time, as every game gives you different paths to victory. It’s up to your drafting prowess to skillfully hop your way to victory. This game will definitely stay in my collection. The retail price of this game is $49.99, and that feels about right for all the components inside. You can sometimes find it cheaper that retail price. Check the current price on Amazon.com. It reminds me a big of another drafting / board game our family loves called Medieval Academy. Maybe I’ll do a review for Medieval Academy for you soon. All in All Two Big Bunny Ears up for me!